HONOLULU (Reuters) - Scientists in Hawaii say they have discovered an ancient underwater volcano, now dormant, that once extended 3,000 feet above sea level and is believed to have helped form the island of Oahu. The newly documented volcano, named Kaena, began erupting some 5 million years ago in the channel between what is now Oahu and its neighbor island Kauai, according to a study published this month in the Geological Society of America Bulletin. "We thought we knew where all the Hawaiian volcanoes were, and here's one we didn't really know about," John Sinton, a geologist at the University of Hawaii at Manoa and lead author of the study, said on Monday. The island of Oahu, home to the state's capital and largest city, Honolulu, is known for its two soaring mountain ranges - Waianae to the west and Koolau to the east. Until the latest discovery, geologists believed Oahu was formed entirely by the two volcanoes that created these ridges. The new research revealed that Oahu once had a third volcano and resulting mountain peak farther to the west, Kaena, which has since receded back beneath the surface of the Pacific. While Kaena was the first-born of the three, Waianae surfaced sooner on the eastern flanks of its older sibling about 3.9 million years ago. Kaena broke the surface some 400,000 years later, followed by Koolau in another 500,000 years, the study found. "By 3 million years ago, all three were emergent," Sinton said. "These islands are always subsiding even when they're growing. Once any volcano stops erupting they continue to sink. We just don't know when Kaena went underwater." Scientists are still examining various clues for answers to that question, including lava formations that show signs of erosion. Kaena was not terribly high, probably rising no more than 1,000 meters, or about 3,300 feet, above sea level, Sinton said. 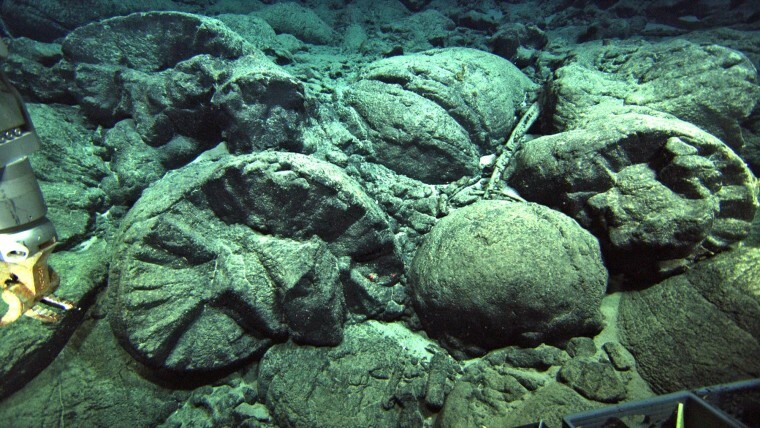 "It explains a lot of things about Oahu," he said, noting that the discovery was made while geologists were investigating an area off the western tip of Oahu that was once thought to simply be a submarine extension of the Waianae range.